In Joburg, icy mornings are giving way to sunny afternoons, while golden days in coastal Cape Town are interspersed with welcome rain. With winter well and truly here and mid-year school holidays coming up in both Jozi and the Mother City, now’s a great time to plan a family day out with City Sightseeing’s 3-for-1 Kids’ Special. This fabulous offer, valid on weekends, school holidays and public holidays until 8 October 2018, allows two children (under 18) to hop on a wide variety of tours for free with a paying adult. Alternatively, opt for one of two 3-for-1 Kids’ Special boat rides. Two kids hop on the Waterfront Harbour Cruise for free if they’re with a paying adult – or choose the same deal with the Canal Cruise, departing every 20 minutes from the jetty outside the Two Oceans Aquarium and travelling to the Cape Town International Convention Centre, stopping off at the One&Only Cape Town, City Lodge and Harbour Bridge. 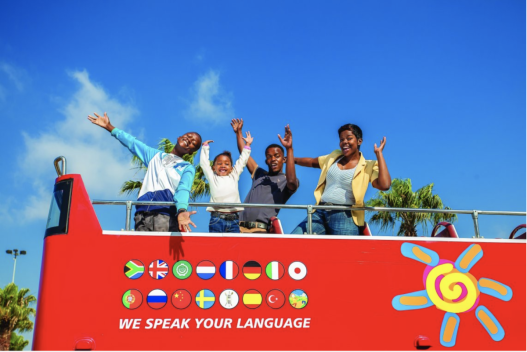 Both cruises have on-board commentary in 15 languages and a kids’ channel. Enjoy the scenery, see the V&A Waterfront’s resident seals and learn more about Cape Town’s nautical history. If you're in Cape Town, there are two 3-for-1 specials: the Classic bus ticket and the one-day Harbour or Canal Cruise ticket. In Joburg you can choose between two options: the one-day red bus ticket and the one-day red bus and Soweto Combo tour ticket. Buy your adult tickets from our tour offices in Cape Town (stop 1, 5 and 8) and Joburg (stop 1), or online (click here for Cape Town, and here for Joburg). You'll receive the adult tickets online and the kids’ tickets on the day only. Simply bring your printed ticket with barcode to a City Sightseeing tour office to pick up the children’s tickets; or have your barcode scanned by your bus driver as you hop on the bus. The Cape Town winter timetable sees the first bus departing from the V&A Waterfront (stop 1) at 8.40am, and the last bus of the day stopping at the V&A Waterfront (stop 1) at 6.11pm and terminating at 81 Long Street (stop 5). The Joburg winter timetable has the first buses departing at 9am from Rosebank (stop 1) and Gold Reef City (stop 13) respectively. The last stop of the day is at 6.15pm in Rosebank (stop 1). With our 3-for-1 Kids’ Special two kids under 18 hop on the Harbour Cruise for FREE!